Becoming a massage therapist was a dream of mine for many years. Before I started the massage therapy training program at NHI, I wasn’t sure which area of massage I was most interested in pursuing. 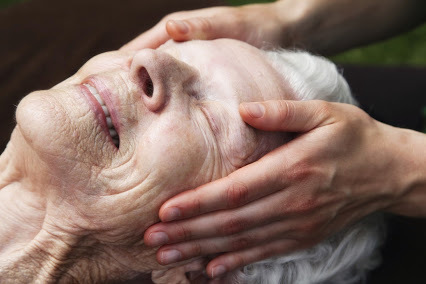 During the program, I realized that I wanted to focus on geriatric massage, which is a form of massage designed to meet the specific needs of the elderly population. It involves using massage to manipulate the soft tissues of the body to improve blood circulation, relieve pain and increase range of motion. My dream was to help elderly people who are in pain, and that is what I am doing today. During my training at NHI, my grandfather was ill and a hospice nurse care came to help him and my family. The hospice nurses were so supportive and helpful. They would do anything in their power to help us with anything we needed. When they would come to the door with a smile on their face, it would make a gloomy situation into something bearable. They became our friends. I decided that I wanted to help people get through painful and difficult times. My skills as a massage therapist gave me a way to help people. I contacted a Hospice facility and informed them that I was interested in volunteering. The volunteer coordinator was so excited because they did not offer massage. When I got the call to do my first massage I was so excited. I did my first massage on a woman who lives in an assisted living home. The women told me that she was so excited that I was coming over that she put makeup on. I noticed that she had skeletal issues because she was in a curled position on the bed and she need constant oxygen. I was a little nervous but I kept telling myself that I could do this and that my training had prepared me for this moment. She asked me to massage her feet and ankles. At first, I used my knowledge of foot reflexology and then just did a relaxing massage. I could tell that she was relaxed and that the pain that previously existed when I first got to her house was dissolving. During the massage she told me stories about her family and her career and that she was once a ballerina. We had a wonderful time chatting and before I knew it, two hours had gone by and it was time for me to leave. We planned another visit and said our goodbyes. As I was walking out the door, she said thanks for being her new friend. I was thrilled to be able to put a smile on someone’s face. I had not thought about how much of an effect the massage would have on her. She was moving around better, her breathing was not labored, and the color had returned to her face. This was a reminder of the beautiful effects a massage therapist can have on someone’s life. The smile on my face has not gone away. I am looking forward to visiting my friend next week. I will always be a Hospice Volunteer. Yep, I am a Massage Therapist and I love it.